In this guide we will show you how to upgrade your Frsky X series R/C receivers with your Taranis Radio via the smart port. Standard servo cables have the red voltage wire in the middle, however you need to change one end to swap the voltage and ground pins around and the other end connects to the smart port of your receiver. This is very easy for the X8R receiver, In the case of the X4R, or X4R-SB upgrade, a cable is already included with the receiver. All you need to do with the X4R cable is also swap the servo connector end so that the red wire is on the end and ground is in the middle. 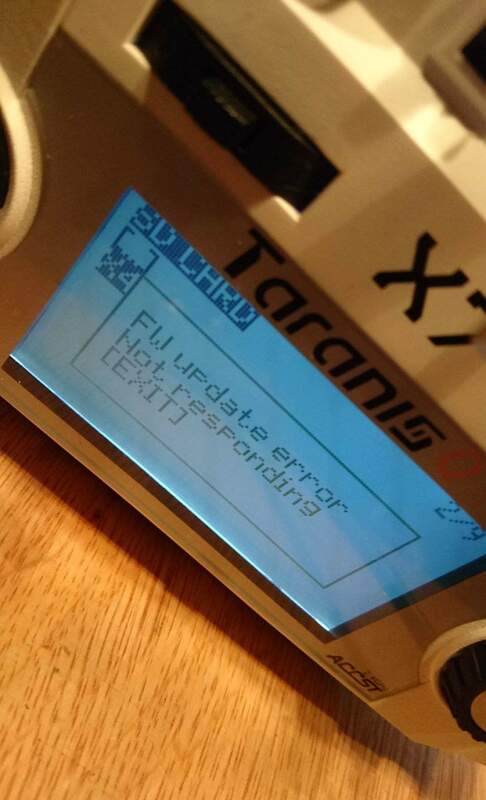 Its a good idea to make sure your Taranis radio is fully charged as you could brick your device if the battery dies in the middle of the firmware upgrade process. 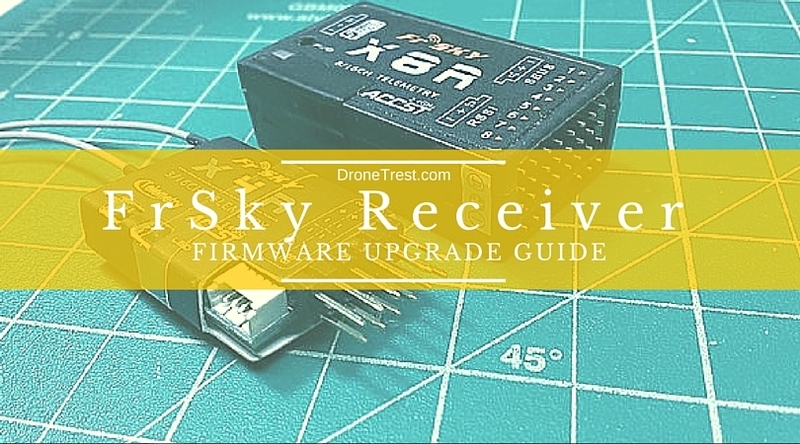 The first thing you need to do is download the latest firmware from the FRsky Website for your receiver. Now turn on your taranis and long press the menu button untill you enter the SD card browser, then navigate to the firmwares folder. Now you need to select the firmware .frk file that you downlaoded for your receiver. once you press enter a sub menu will open where you must select flash external device option. You wlll then see a progress bar showing the progress of hte firmware flashing process. Once done you can turn off your taranis and unplug your receiver. If you have any issues getting this working please let me know and I will be happy to try help. I just burned my X8R. Well, at least that’s what I think as it won’t power up anymore after “firmware update error”. Why? - The GND and +Vcc pins on your picture are swapped (on Taranis picture). The +Vcc pin is in the middle. Anyone has a spare XC6201-332? Thanks for pointing that out, the images above are wrong . I guess that is what happens when you try make diagrams too late at night! I have just fixed them so thanks for pointing that out. As for your X8R, doe you get any LED’s now when you apply power to it? Hi! Good there was at least some use for my failure (I mean pictures fixed and others will do better). As for my receiver - nope, nothing lights up when I power it up. First time after connecting and getting “firmware update error” (before I realized the polarity was wrong) I powered the receiver up and got both green and red LEDs solid, that’s when I started suspecting something went wrong. The next time I connected it correctly to the Taranis I got the same error, but after that LEDs wouldn’t light up again. So I suspect the voltage regulator got fried (at least I hope it’s the only thing fried ), will verify that later. In the meantime ordered a bunch of XC6201P332 (will arrive in something from a week to a month and a half). Hi are are the pictures/ diagrams right now ? How to connect X4R ? So from the bottom pin on taranis is signal, then ground then voltage. I’m honestly not sure, as havnt had this issue myself, but my guess is that maybe you don’t have the correct firmware file? A small update from me: I managed to replace the fried XC6201P332 voltage regulator on my X8R - and it seems to be working (blinking led, etc). I have a Taranis + fw 3-something. I have never come across the SD-card menu. When I press menu briefly I come to Model setup. Press a second I come to Radio setup. If I press a minute, still nothing more than radio setup. Tried to google SD-card menu, but with no luck. Can you offer any help? Where did you get the voltage regulator for your receiver? Could you say about XC6201-332? My X8R not power on after flash firmware fail too. YES, Hero! it works. I did try it but with the crossed servo cable, with the straight one in the future use plug, it works perfectly. Many thanks for sharing this!! !